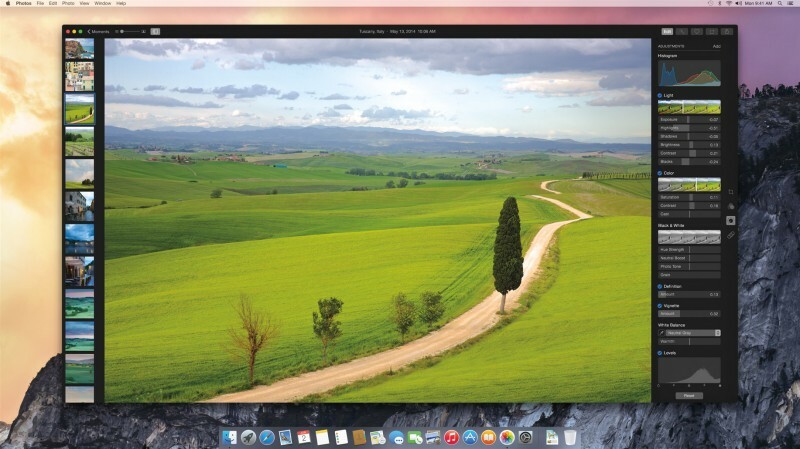 Last week, Apple announced that the company would be discontinuing their Aperture photo management software to focus development on the new Photos app that was introduced at WWDC. Details on Apple’s new Photos app, however, remains scarce, leaving Aperture users with a lot of uncertainty. When asked about what Aperture-like features users can expect from the new Photos app, an Apple representative mentioned plans for professional-grade features such as image search, editing, effects, and most notably, third-party extensibility. The screenshot shows an adjustments panel with settings for Light (Exposure, Highlights, Shadows, Brightness, Contrast, Blacks), Color (Saturation, Contrast, Cast), Black & White (Hue Strength, Neutral Boost, Photo Tone, Grain), Definition, Vignette, White Balance, and Levels. Apple has promised that existing Aperture users will be able to import their libraries into the new OS X Photos app. Photos is expected to be released early next year.